BP02 - Our Two Person Deluxe Survival Kit - Backpack has the essentials needed to support two adults for three days. The easy to transport supplies conveniently stored in a nylon backpack. (2) 2400 Calorie food bar - This has a five year shelf life and is approved by the US and International Coast Guard. (2) Tissue Pack - Very useful for personal hygiene. (2) Rain Poncho - This emergency rain poncho will help keep you dry. (1) Safety Whistle - Can be used in emergency to let people know where you are. 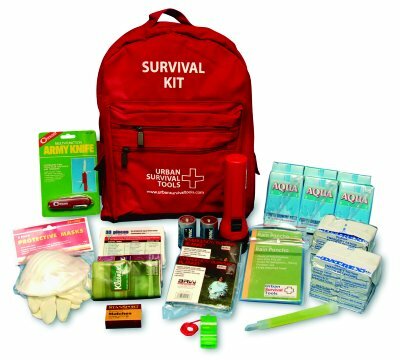 (1) 32 Piece First Aid Kit - This first aid kit has all the essentials you need. (1) Flashlight - This is a 2 "D" cell flashlight with heavy duty batteries included. (50) Waterproof Matches - These matches will light even if they are wet. (1) Dust Mask- Helps during cleanup or exposure to dust. (1) Pair of Latex Gloves - Useful for emergency first aid or sanitation.